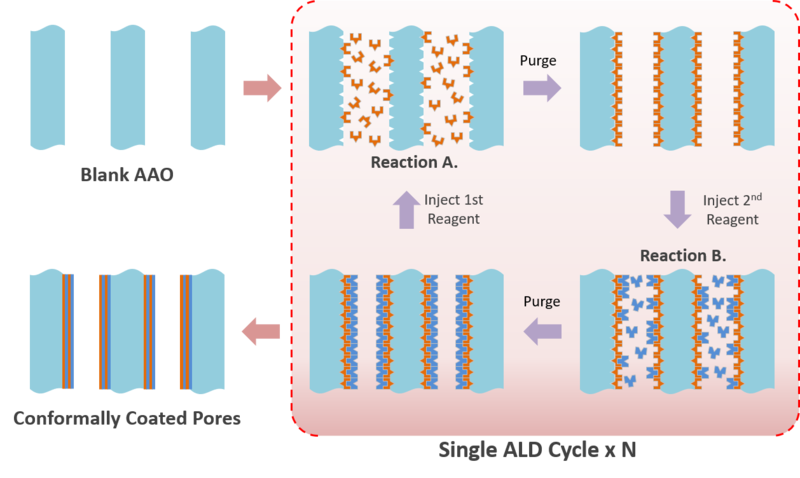 Atomic Layer Deposition (ALD) is a gas phase deposition process based on sequential surface reactions to grow thin films of different materials, wherein the target substrate is exposed, sequentially, to one such reaction at a time. These reactions are surface-limited, with only a monolayer of a given precursor reacting with and/or chemisorbing on the surface. The result is a pinhole free, conformal coating, with superior process control in comparison with other thin film deposition methods, such as Chemical Vapor Deposition (CVD) and Physical Vapor Deposition (PVD). New processes continue to emerge for ALD of other materials and composites. The synergistic combination of ALD with Anodic Aluminum Oxide (AAO) enables control of both the nanoscale geometry and chemistry with precision unavailable with other processes and materials. The resulting well-characterized nanomaterial platform is ideally suited to support development and validation of high surface area ALD as well as to provide new avenues for expanding the library of AAO-based functional materials and devices. Fully conformal coatings of alumina and zinc oxides inside very high aspect ratio nanopores of AAO was demonstrated for the first time by Elam, Routkevitch and George in 2003. Materials for energy generations and storage (i.e. photocatalytic materials, electrodes for batteries and supercapacitors). 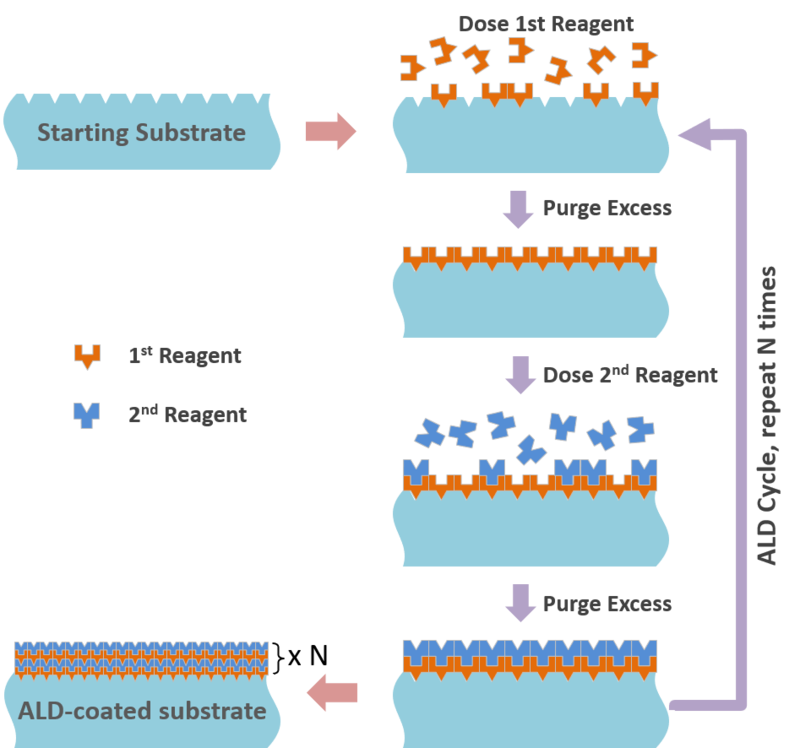 Many applications involve deposition of highly engineered ALD coatings onto high surface area substrates, from integrated circuits with complex topology and high aspect ratio vias to nanoparticles and nanoporous membranes (such as Anodic Aluminum Oxide (AAO). This capability is now offered by InRedox through a unique partnership with Arradiance, a recognized leader in ALD equipment and process development, serving the materials science, nanotechnology, clean energy, nano-electronics and photonics markets. 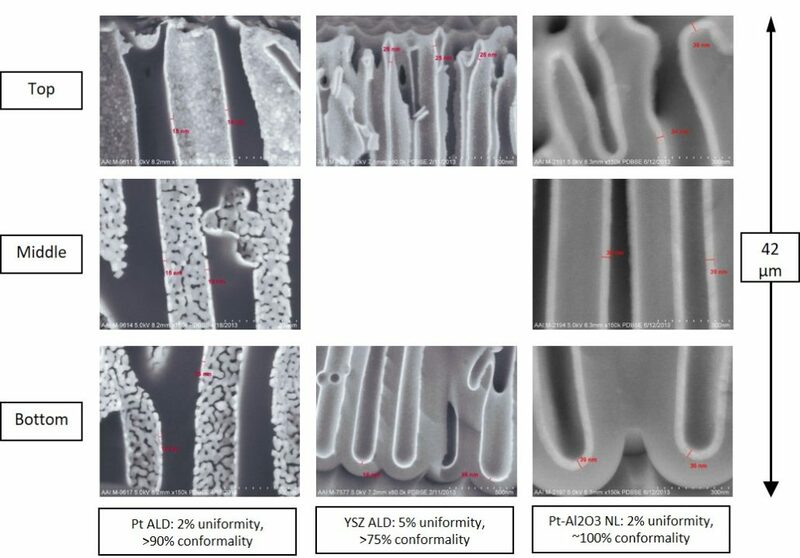 A core ALD capability, for which Arradiance has received more than 12 US patents (with several pending), is the application of functional nanocoatings to high-aspect-ratio, high-surface-area substrates. Nanoporous AAO Reference Substrates as low-cost surrogates for development of ALD on other high aspect ratio substrates (contact us for details). Conformal ALD inside high aspect ratio nanopores of InRedox’ AAO films was demonstrated by Arradiance for platinum (Pt); yittria-stabilized zirconia (YSZ) and platinum- alumina (Pt-Al203) nanolaminates. Nanoporous AAO films on Al substrate with pores closed at the bottom. Pore diameter 50 nm, pore length or AAO thickness 42 μm, aspect ratio of ~840:1, total surface area greater than 9 m2. Yittria stabilized zirconia (YSZ) nanofilm for solid oxide fuel cells. Conducting and insulating nanofilms for supercapacitors.